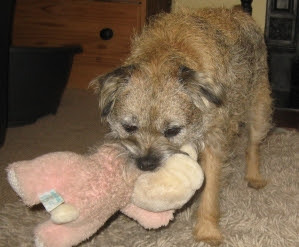 Once the terrier has burrowed in and retrieved the pink animal, he gives it a jolly good shaking, making lots of growly noises. This is another keyskill for a ratter. Key skills for dogs like Harry don't involve any writing reading and arithmetic. If we had not taken Harry away from the farm where he was born, he might have turned into a ratter like his dad. 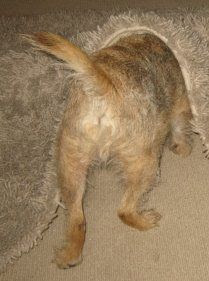 Harry shows here one of the key skills of a ratter - the desire to pursue his quarry down a hole. Harry does not normally eat quite so close to Pushkin. This was just me creating a photo opportunity for Harry's blog. 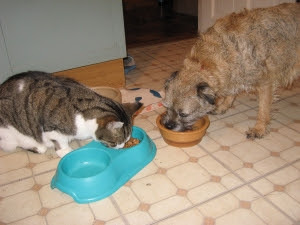 Harry got through his food twice as fast, and moved in to start on Pushkin's, til I said "Harry?"